As part of our continuing series on filthy reverse merger Gopher Protocol (GOPH), we’ll start to explore exactly who controls the company. Just looking at common stock is not enough, one must look at the various series of convertible bonds, warrants, and preferred stock. Some of which have conversion prices under 1c! Here is a snapshot of GOPH ownership from before the stock promotion began in earnest. These numbers have certainly changed. The short answer, is Galina Vaynter, through various entities and related parties. These include companies headed by her husband, Avady aka Vadim Vaynter, her daughter Regina Kats, and various straw men and women, including this guy, Kenneth Jeremy Smith, in Spokane, WA. There’s lots more to come…. Before we begin, do you know about Sony guts? If the rambling, raving, Israeli CTO, Dr. Danny Rittman, at Southern California reverse-merger company Gopher Protocol (GOPH), is to be believed, it seems that almost everything will one day have Gopher guts inside. Pet trackers, cell phones, even cryptocoins! 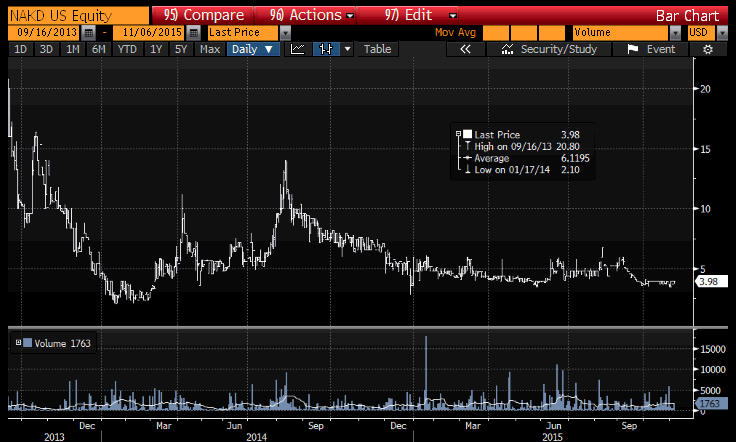 But one thing that is already stuffed to the gills with Gopher guts, is Long Island penny stock Mobiquity (MOBQ). Back in June of this year they issued a curious press release highlighting an even more curious transaction. NEW YORK, June 25, 2018 (GLOBE NEWSWIRE) — Mobiquity Technologies, Inc.
Quite a description of Glen Eagles. If it sounds familiar, that might be because the description of GOPH is almost exactly the same. Now, what is this “strategic investment” that the Eagles are making into MOBQ? Poor Mannkind (MNKD). The lamest endocrinology company in existence just did a deal so awful it rivals the infamous Repros 99.6% Discounted Warrant deal from 2011. Read about that stinker here. Each share of common stock is being sold together with a warrant to purchase 0.75 of a share of common stock (A Warrants) and a warrant to purchase 0.25 of a share of common stock (B Warrants) for a combined purchase price of $1.03. Each unit consists of one share of common stock. 3/4 of a Series A warrant, and 1/4 of a Series B warrant. The Series A warrants expire in 2 years, and have typical American-style exercise rules. The Series B warrants expire in December 2018. The B warrants have a variation of a European-style exercise rule. So what is this prize package worth to the buyers? A share of stock is worth $1.32 at last close. giving the lucky buyers an immediate paper profit of 120%, and giving existing MNKD bagholders incredible dilution. And in fact, the company did pick up and move, to shiny offices in New York City. And yet, the pull of Vancouver is strong. Just a few weeks ago Anavex announced the hiring of a new CFO. Sandra Boenisch. A quick read of the 8K filing announcing her arrival, and a look at her resume, leads to more questions than answers. A CFO capable of handing the workload of a ~380mm USD market cap biotech (at time of writing) that supposedly has the cure for Alzheimer’s Disease and Parkinson’s Disease (if the dumb donkey longs and touts are to be believed) can be hired for just $78,000 CAD per year salary (roughly $59,500 USD at time of writing)? Really? Ms. Boenisch has been an independent consultant, providing financial reporting services to a range of public companies in the United States and Canada since January 2012. 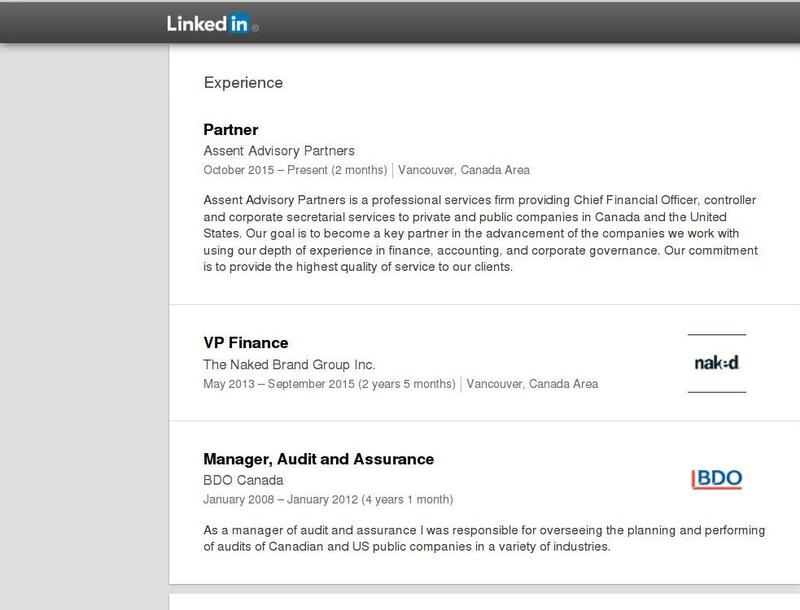 From 2008 until 2012, Ms. Boenisch was employed at BDO Canada LLP (Vancouver, BC) where she was hired as a Senior Accountant and was later promoted to Manager, Audit Assurance. Ms. Boenisch specialized in managing assurance engagements for public companies in the United States and Canada. Prior to that, Ms. Boenisch worked for a public accounting firm beginning in 2001. Well there is our Vancouver connection, but she has no experience as a CFO, and none in biotech. And what did she do between January 2012 and getting this amazing job at revolutionary, world-changing, Anavex? The 8K says she was an independent consultant. However her LinkedIn page says something very different. That’s not what the 8K filing says, now is it? It turns out she does have some experience in the past with a public company, Naked Brand Group, Inc is actually publicly traded Naked Brands (NAKD). Insert your own jokes about Anavex’s head of Business Development and Investor Relations, Nell Rebowe, here. Sure enough, just like Anavex, Naked Brands started life as a Nevada shell company, in this case a little piece of junk called “SearchByHeadlines.com” (SBHL) which obtained a listing in 2007. The Headlines shell then acquired a dismal little underwear company called Naked Boxer Brief Clothing, Inc. creating yet another wretched reverse merger polluting the lower reaches of Wall Street (& Howe Street) NAKD. Sandra joined NAKD a year later, in May 2013 as VP of Finance. But being a piece of junk Canadian company merged into a Nevada shell, and hiring Sandra Boenish, are not the only things AVXL and NAKD have in common. There’s more. In September of 2013, NAKD announced with great fanfare an investment from an institutional investor. Retail longs seem incapable of understanding that difference between a legitimate long term institutional investor, and what could kindly be described as the newest incarnation of 90s death-spiral shops. Here is a chart of NAKD’s share price from the date of that investment, 16 September 2013 until today. Share price from 16 Sept 2013 until present. Pretty impressive performance. The investor? Why none other than AVXL’s recently announced institutional investor, the sharks at Lincoln Park Capital. Read more about Lincoln Park here. A 416 (Ontario) area code for a NYC-based, Nevada corporation, with a CFO in Vancouver? Odd, right? A quick search of that number leads to a stock promotion outfit in Toronto, Primoris Group, a firm with 2 co-founders who are no strangers to the seedy world of micro-crap Canadian stock message boards. Maybe we’ll tear apart Anavex‘s ridiculous “study” claims over the weekend. Until then, lets see how the dynamic CFO and IR due of Sandra and Nell do, especially with their Toronto stock pumping friends.